The Seaport offers more than 2,000 feet (611 meters) of continuous berth space. Passengers enjoy the convenience of moving direct from ship-to-shore. Covered hydraulic gangways lead directly into Pavilion 22, the new cruise passenger handling facility. Pavilion 22 offers visitors the best of Nova Scotian handcrafts, gifts and signature products. Phones, tour and visitor information are also available at the facility. Tour buses and taxis are conveniently located in front of Pavilion 22. The main waterfront attractions begin at the start of the boardwalk close to which the Halifax cruise terminal is located. It's a short walk along Lower Water Street to the city. Halifax is small and easily walkable. The main waterfront attractions begin at the start of the boardwalk and continue on for the next three quarters of a mile. 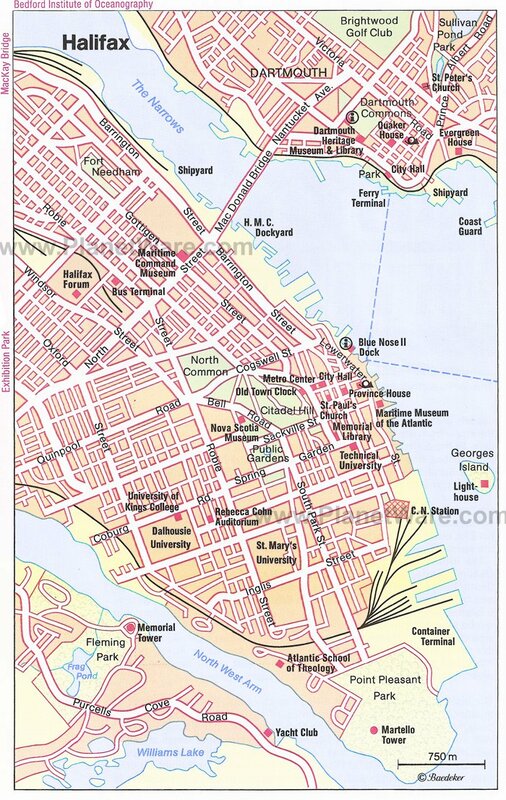 The main landmark is the Halifax Citadel, on a high hill above the city, and it conveniently divides the city into three districts: the South End, representing the older, wealthier urban core south of the Citadel; the North End, the grittier northern suburbs destroyed by the Explosion; and the largely residential West End. The downtown core is sandwiched between the Citadel and the sea, making navigation a snap. Pier 21, Canada's equivalent of New York's Ellis Island, this historic waterfront building processed over a million immigrants. Now converted into a modern museum with extensive exhibits related to Canadian immigration. The Garrison Brewery, the Farmers Market, and the Pier 21 museum are next to the ship's dock. Halifax old town is best explored on foot. The Harbour Hoppers are refitted Larc V vehicles capable of traveling on land and water. This tour is unlike any other in Nova Scotia and subsequently has become the one of the most popular tours in Atlantic Canada. Halifax Citadel- It would be a 1/2 hour walk to the Top or about $10.00 for a taxi from the Ship. If you get there before 12.00 noon . Each day they have the firing of the Noon Day Gun right at 12.00. There is a little Ceremony as well for this. Peggys Cove is one of the busiest tourist attractions in Nova Scotia. Titanic cementary is just a short cab ride away. Farmers' Market, 1496 Lower Water Street, The oldest running Farmer's Market in North America, located in a crazy maze of underground halls and passageways in and around the Alexander Keith brewery. Always very busy with people buying ethnic and local foods, plants, artwork, clothing and all sorts of other interesting stuff that you may or may not expect to find at a Farmer's Market. Don't haggle. Buskers play music in the hallways between retail areas. This market is held indoors so it is open year-round, but only on Saturdays from 7 AM to 1 PM. Nova Scotian Crystal 15 minutes walk down by the Ferry Terminal. This is the only Crystal Glass Blowing place in North America. The new terminal with the farmer's market etc has free WiFi.